ROME—On the morning when the oldest of her 13 children became a cardinal of the Church, Marie Tobin started her day with a simple prayer. “I woke up this morning saying, ‘This is the day the Lord has made. Let us rejoice and be glad’ ” (Ps 118:24). At 93, Mrs. Tobin had two main reasons to rejoice as she waited for the start of a memorable ceremony on Nov. 19 in St. Peter’s Basilica at the Vatican. Within an hour, her son “Joe” would be installed as one of 17 new cardinals by Pope Francis. And just as meaningful to her, she was surrounded by so many members of her family who had traveled to Rome to do what she says the Tobin clan does best—be there for each other. 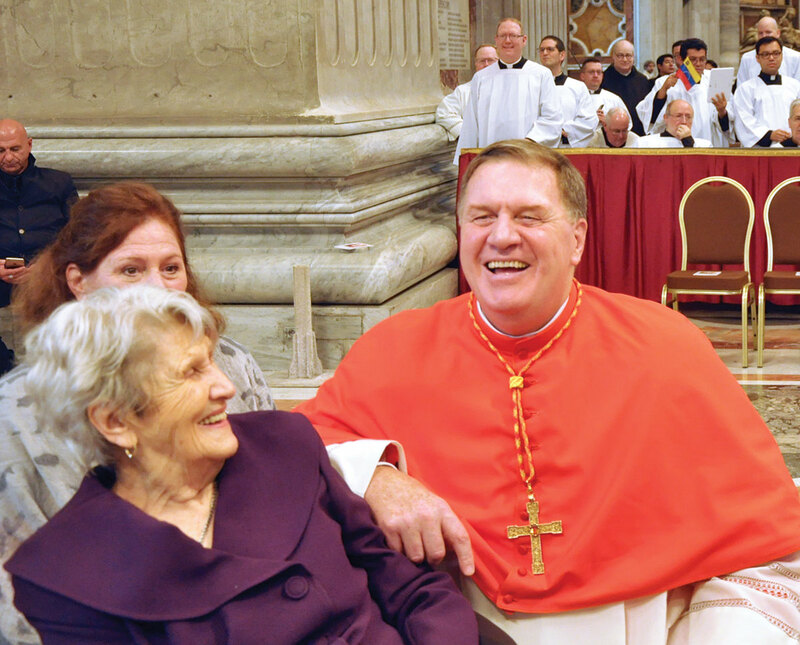 On this day, all but one of her children—he had a scheduled surgery—was there to witness the installation of Cardinal Joseph W. Tobin. Their mother never imagined that scene or that possibility all those years ago when she and her late husband Joe were married. Back then, their goals were to create a large family, a family based on faith and love. They named their first son Joseph, a boy who was a gift from the beginning, she said. It’s a role he learned from his father, who died at the age of 54 of a heart attack he suffered after helping people stranded in a blizzard. “He’s here,” she said about her husband. “He’s residing in heaven. He’s looking down on us every day. He’s been taking care of us for 40 years since he’s been in heaven. I never felt I was raising the kids alone. On this day, her oldest son’s life has led her to Rome and St. Peter’s—a trip she wasn’t going to miss. “It’s really brave of her at 93 to cross an ocean,” said her oldest child on the evening before he became a cardinal. “Mom always appreciates the times when the whole family is together. And it can be anywhere. I think this is a big deal because she’s a woman of faith. She sees this in the larger picture of her own engagement with God and the Church. Perhaps the most touching displays of love on this morning started inside St. Peter’s before the ceremony—as Cardinal-to-be Tobin waited anxiously for his mother to arrive, followed by how he embraced and kissed her when he found she was there. Then came the moment when she watched her son walk up the steps to the central altar where Pope Francis waited to give him his cardinal’s ring and place his red biretta on his head. That feeling of joy led her to think of her husband again.